If you are a beginner and need information on rearing from small caterpillars, or hatching out pupae, please order the All Colour Paperback BUTTERFLIES. INSTRUCTIONS ARE NOT SENT WITH EACH SPECIES, you need to acquire basic skills and this book is a simple way of doing so. 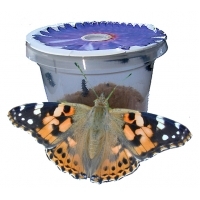 Please read the Plastic Rearing Container section for advice on rearing young caterpillars which must have nursery treatment while they are not large enough to be kept in cages. This information is enlarged upon in the paperback guide referred to above. We do not invoice: please use school or personal credit card to order on this website, and reclaim with the invoice printed from your account.Thank you. This is an innovative design. The cage is folded absolutely flat. Pull on the centre fold and it forms an instant 30cm cube with netting on all panels, except for one which is clear plastic. 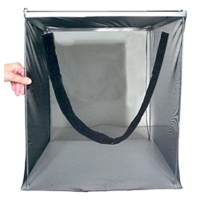 This can be used as a waterproof base or as a side observation panel. Access is via a rounded zip in one netting side. Ideal for laying out pupae to emerge. You can keep larvae or stick insects on jars of cut food. But the multitude of uses becomes more apparent as you try out new methods. 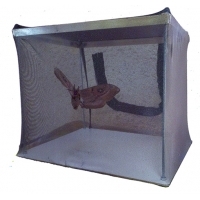 With the cage positioned over a growing plant you can feed and breed butterflies. The cage can be used as a sleeve on the branch of a tree. Keep butterflies on cut flowers. 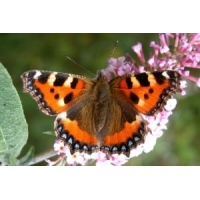 Use the Magicage for hibernating butterflies. 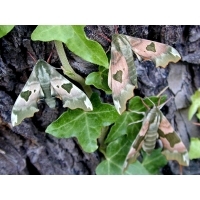 Breed Silkmoths and Hawkmoths in the Magicage. There has probably never been such a versatile cage. Once you start using the Magicage, you may wish you had thought of having more of them! Probably the most useful size as a general purpose cage. 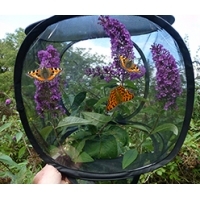 Suitable for breeding butterflies and moths, laying out pupae to emerge, keeping larvae that are large enough to cage, also for Stick insects and other creatures. Occupies little space. Can be stacked if required. This size is much lower in price and larger than the Flat-pack Wooden Framed Cage range, and much less costly to send. One of the best species for young people and beginners. Larvae are sent in April/May. The best way to keep the young caterpillars is on potted nettles which should be prepared in early spring , regularly watered, and kept out of doors to make stocky growth. Prepare more than one pot of nettle. When the young larvae are received, bring the potted nettle indoors and place the young larvae on the foodplant, where they will look after themselves until they finish the food and are large enough to be kept in a cage on cut nettle in a jar of water. In a matter of weeks the pupae are formed hanging from the cage top, and the butterflies emerge in a little over a fortnight. The butterflies can be kept in a cage for a few days, with plenty of flowers for nectar, and then released to help the wild populations. Keeping two species of larvae together on the same foodplant? It is sometimes possible, but their way of life may differ and we recommend keeping them separately. 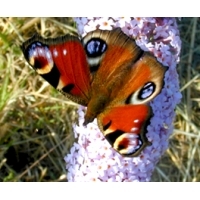 In Britain there is only one generation of Peacock Butterfly, but in captivity more will be available in July. The larvae live in tight clusters on the tips of growing nettle. When the larvae are larger, keep them caged on cut stems of nettle in a jar of water. Pupae are formed in a matter of weeks, hanging from the cage top. Butterflies emerge in about 3 weeks. They can be kept for a few days in a cage with flowers for nectar, then released into the wild. Peaock larvae need fresh nettle, growing if possible. If you wish to rear the larvae in plastic boxes, while they are small, they can be kept on a lining of absorbent paper, with a sizeable sprig of fresh, un-wilted nettle. The paper lining must be changed and fresh food given EVERY day (including weekends). Place the previous day’s food with larvae on the new paper liner, add a fresh and adequate sprig of nettle, and the larvae will transfer themselves to the new food. Give them entire nettle stems with leaves, not leaves alone. Close the lid and keep the box out of sunlight. The closed container keeps the foodplant fresh. No holes are needed because there is more than enough trapped air for larvae to breathe. Never allow excessive condensation, nor mould. The size of box should be chosen according to the size and number of larvae being reared. The size 5 box is large enough to house them once they have grown for a week or two. For smaller larvae the Size 8 is appropriate. When the larvae have become too large for the box, they can be kept in a cage, with the nettle kept fresh in a jar of water. The pupae are formed hanging from the top of the cage and the foodplant. Orders to be sent internationally will be sent feeding on diet instead of leaf. This means they travel better in the journey by post, and they can be changed to leaf on arrival. 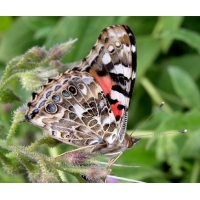 The Painted Lady butterfly occurs in more continents of the world than any other butterfly. The larvae are easy to rear on Thistle (its preferred food plant), Burdock, Stinging Nettle, Mallow, Hollyhock and will often take other foodplants. An ideal species for schools. Each larva lives solitarily from birth. It spins a protective silk cover, living at first off the leaf cuticle. When possible, keep the larvae on a growing foodplant, which enables the caterpillar to make its silk cover, and move on to fresh food when it requires. If kept on cut food, please ensure that the plant is kept fresh and changed before the quality of the food suffers. This of course applies to all species, but the method has to take into account the solitary habit of the larva, and its protective silk. The best way is to enclose pot and foodplant in a sleeve. The WWB zipped sleeves make this a very convenient rearing method. Depending on temperature, the larvae pupate in a little over a month. Butterflies emerge in 2-3 weeks. The cycle continues throughout summer and several broods are possible in a season. 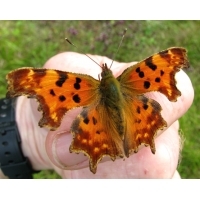 The butterflies can be kept with nectar flowers for some days, and then except in the colder months October to March, released to breed in the wild. There may be a delay of a couple of weeks if larvae are not at the right size for sending. Can be ordered immediately. Larvae are often quite small when sent. Too small to be put into a cage or aquarium. They are best reared on growing foodplant, enclosed in a sleeve. Alternatively keep in a plastic box, lined with absorbent paper, and changed daily. 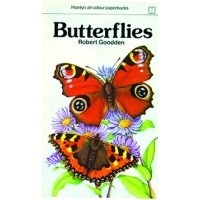 For details see the All Colour Paperback BUTTERFLIES. Fascinating larvae with curious half and half markings in black, brown and white, mimicking a bird dropping. The larvae feed on Stinging Nettle, Elm and Hop. Also Sallow, Osier Willow Salix viminalis, and sometimes other Willows. They live singly. Fast growing. Young larvae will succeed best if placed on growing foodplant. Enclose plant and pot in a netting sleeve, tied at both ends: size 3 is ideal. Otherwise you can sleeve Comma larvae on branches of Elm, Sallow and Willows, including Osier. Good ventilation is required. Cut food is not recommended at least until the larvae are nearly half grown. Comma larvae do not like crowding, and do best kept so that each caterpillar can get away and live on its own. Disease can occur if conditions are not perfect. If it does, it helps that the larvae live separately. Any infected or dead larvae should be removed and disinfection should be carried out, lightly spraying 10% bleach solution, which will not affect healthy larvae, but does help prevent the spread of disease. This garden butterfly is capable of re-colonising places where it used to be. In autumn the butterflies are very partial to fallen fruit. With some help this butterfly could be encouraged to spread. Keeping two species of larvae together on the same foodplant? It is sometimes possible, but their way of life may differ and we recommend keeping them separately. Comma larvae live solitary lives and should be reared in their own enclosure. 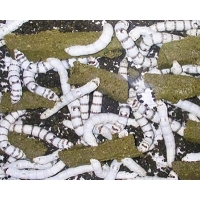 The larvae do particularly well sleeved on growing foodplant but can be kept in plastic boxes or cages. Beautiful streamlined larvae. 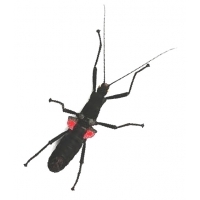 Larger larvae are often heavily marked with flame and scarlet spots and blotches. Very variable. They pupate underground. In captivity they will pupate amongst folds of cloth or absorbent tissue. Store pupae refrigerated for the winter. The moths normally emerge in May/June.